The GROSVENOR AUTUMN 2011 series of auctions ended with a remarkable final total of £3,086,094. The busy November week of auctions began on the 15th with SPECIALISED GREAT BRITAIN, a fine comprehensive auction which more than matched expectations with a total realisation of £853,280 in spite of the exceptional quantity of high value Great Britain material that has overstretched the market in recent months. One item that caught the eye on the first day was the Hume’s ‘Balloon’ caricature envelope (lot 235, left), the only known example bearing an 1840 2d, which rose impressively before leaving our shores for £6,435. There was strong interest in the Ronnie Shiers collection of the 1929 Postal Union Congress on the second day, one popular lot being a rare usage of the £1 on a 1935 airmail envelope to Buenos Aires (lot 1242, below, realized £1,264). Star of the Queen Elizabeth varieties was the unique and visually stunning traffic light block of eight of the 1966 Birds 4d showing four colours missing (lot 1368, left) which flew up to £31,304 before finding its new home. Beginning on the afternoon of November 16th, the BRITISH EMPIRE & FOREIGN COUNTRIES auction achieved a total of £802,300. After a lively section of Miscellaneous & Mixed Lots, the section of the sale dedicated to the award-winning Michael Oliver collection of the De La Rue Colonial Key Plates broke all records by achieving a grand total of £129,760, a figure more than two and a half times that of the pre-sale estimates. It is difficult to choose from among so many exceptional individual realisations but the high prices paid for the De La Rue file copy of the Die I, Plate 2 King George V head die proof (lot 2104, £10,530) and the printers’ handpainted essay for the “POSTAGE & REVENUE” Queen Victoria key plate (lot 2085, featured on the front cover of the catalogue, realized £9,030) certainly reflected their unique status. This was followed by a strong showings of Australian States which contained material from an interesting ‘old-time’ collection, that of Dr Leslie Digby Nelson. Despite slight imperfections, a rare block of four of the Sydney View 2d. greyish blue (S.G. 17, lot 2224) reached a creditable £1,872. Following shortly after, good sections of Barbados and China both made strong showings. The morning of November 17th began with another notable section of Falkland Islands & Antarctica that included a number of rare postal history items from this remote yet highly popular area. 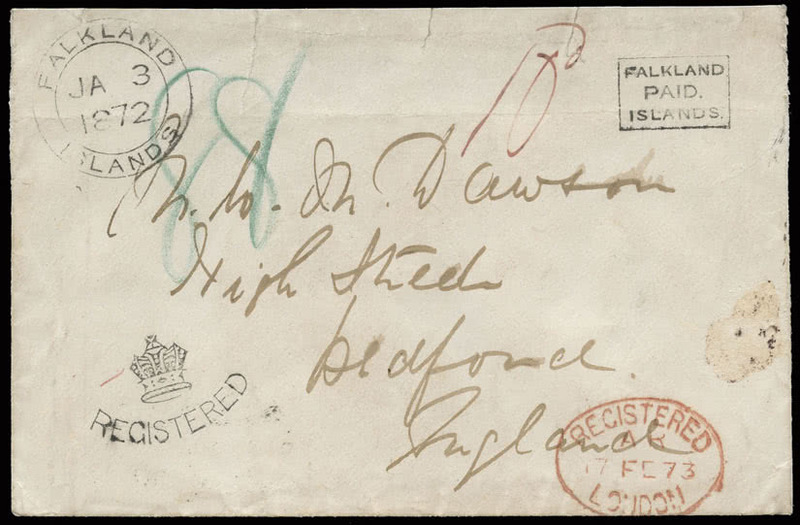 A fine example of the ‘Black Frank’ on envelope registered to England (lot 2590) achieved £9,632 whilst the earliest known cover bearing Falkland Islands stamps (lot 2594) sold for £15,411. The final afternoon saw the highest prices paid for a number of substantial collections that concluded the offering of the extensive holding formed by Dr Ronnie Straus. Important sections in this session included India, one of the “hottest” countries at present with room, book and telephone bidders all particularly active. A rare pilot-signed postcard from the 1911 Allahabad Aerial Post (lot 2961, left) was fiercely contested to £2,925. 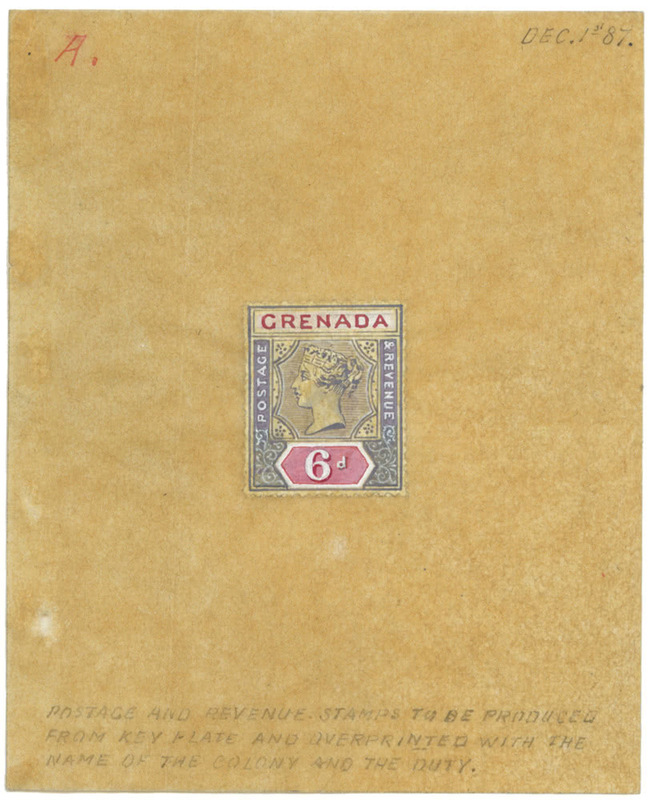 The Michael Rego collection of Saint Lucia also received a strong response with excellent prices including the inside front cover item, an unadopted 1913 essay for a proposed large format design (lot 3259, left) which realised £2,167. More mixed results were seen for the Robin Burges collection of Seychelles, the top price being the £1,084 paid for the 1900 2c. strip of three with scarce Takamaka datestamp cancellations (lot 3357). These excellent results followed a large and exceptionally strong auction of BRITISH EMPIRE & FOREIGN COUNTRIES held on September 28th/29th that achieved a record £1,430,514. 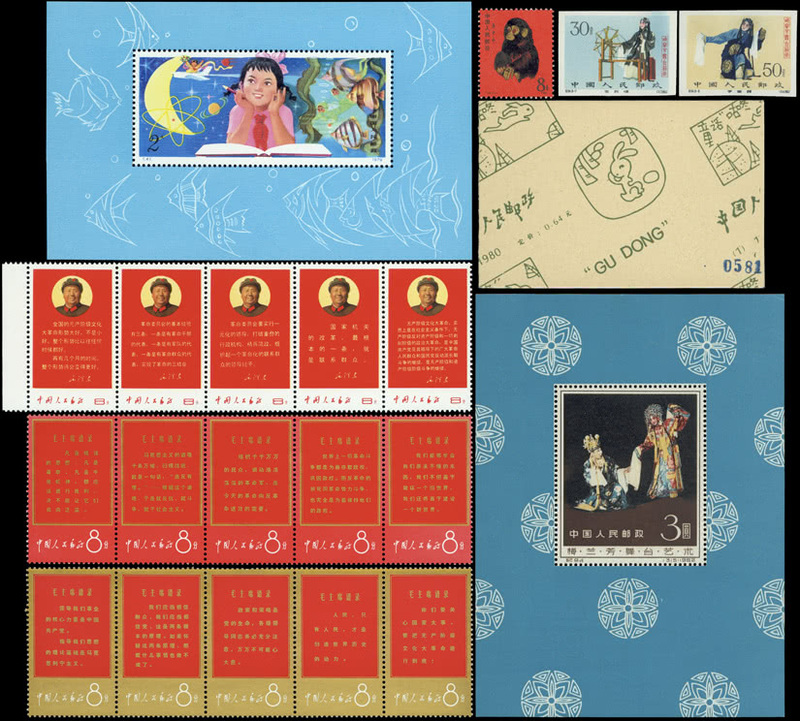 Highest realisation was the £93,912 paid for lot 577, the virtually complete unmounted mint collection of Chinese People’s Republic issues from 1949 to 1999 (estimate £50,000-60,000), another indicator of a very strong China market. Another exceptional price was the £20,475 paid for the India 1854 4a. with frame printed double (lot 826) although this variety is as yet unlisted by Gibbons. Some areas of the Anglo-Boer War period in Southern Africa have been heavily represented in auctions in recent years but the Richard Stroud collection of the Orange Free State contained much that was unusual, particularly with regard to the structure and evolution of letter rates. The star specialised section of the sale on this occasion, though, was the Francis Kiddle collection of Kuwait, a country rarely offered in depth and eagerly anticipated, with realisations to match. 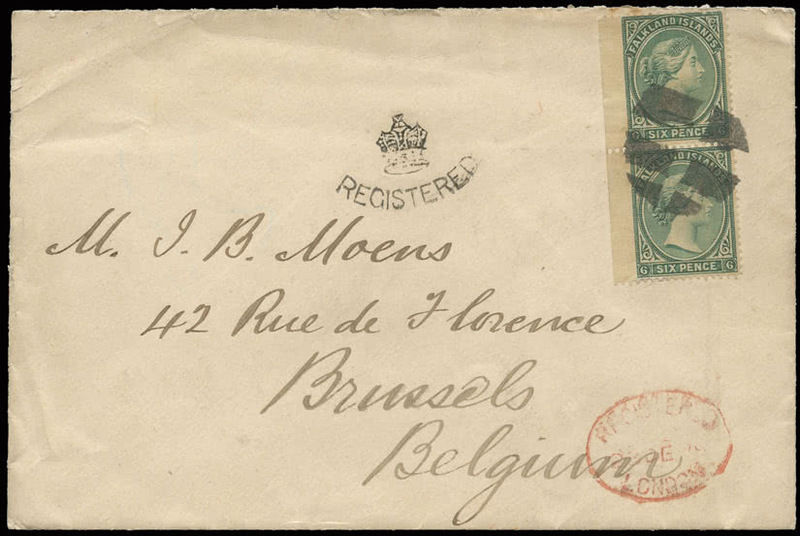 Censored mail was particularly popular with the £18,720 achieved by the 1916 censored and registered cover sent by Political Agent Lt. Col. Robert Hamilton (lot 997) being among the more staggering prices paid. The GROSVENOR SPRING 2012 auctions are now in preparation. British Empire & Foreign Countries is scheduled on March 8th and will feature the Wheldon family collection of Germany, the “Warren” South Africa and “Napoleon” collection of Saint Helena. Further consignments can be accepted until the end of 2011. The next specialised auction of Great Britain is scheduled on April 26th and will feature specialised Machins including the collections Colin Bowen and Kurt Feyrer. Other material for inclusion can be accepted until mid February. A further auction of British Empire & Foreign Countries will be scheduled at the end of May and will include our next specialized section of Falkland Islands & Antarctica.